... unless of course you need to evacuate. Then, by all means, forget about the pancakes. But when hurricane Hanna is overhead and dropping a torrential amount of rain, don't go to the gym (yay! a real excuse this time!) and make some pancakes. I just did. They're made with oatmeal and I added blueberries, so that's just as good as going to the gym, right? Stay outta the rain and be safe east coasters! The pancakes look good, but you need to name them something appropriate for a hurricane, I think. Perfect storm pancakes. Hurricane Hanna Hotcakes. Something like that. 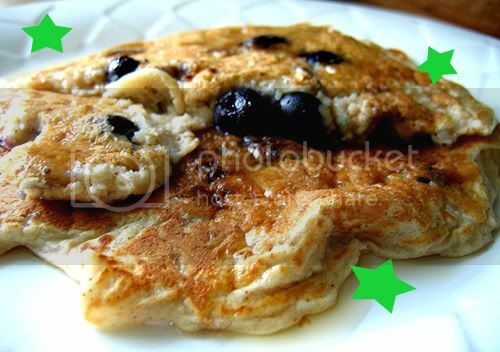 Did you take a pic of the pancakes you really made?Or is it taken from a website? They look and sound good, like an idot I went out to Chick Fil-A for breakfast. They are the real pancakes and my real photography skills (or lack thereof). haha... I still love Chick Fil-A, though. Somehow the ONLY day I ever think of wanting it is Sunday, though! Actually Jake, your photography at times, is very good.With an internship, you could easily become a foodstylist. It is a real artform. Hats off to Chick Fil-a for their closed Sunday philosophy. These pancakes look delicious. Yummm.